Every Tuesday. Hosted by PBC Classics Car Club. The show is open-to-all, and there’s a 10% discount to club members. Every Tuesday. Hosted by the Tampa Bay Antique Vehicles Association, it’s open-to-all, is FREE, with trophies, registrant giveaways, 50/50 raffle, music, special themed events, and a fun time for all. Every month on the second Tuesday. Free for all years cars and trucks. Every Tuesday. Hosted by the South Florida Vettes. Preferred parking and discounts on food and beverage. Come and join fellow Corvette owners and enthusiasts for cold drinks and good food. Every Tuesday. Hosted by Lew’s Crew and Carpro Auto Spa of Stuart. 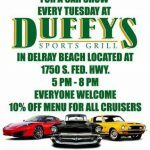 This is the longest running car show on the Treasure Coast.